Construction: Frames: steamed 2" X 2" oak on 11" centers; Plank: Douglas fir 1-1/2"
Engine: Yanmar 44 hp diesel. Looking for a new lover of schooners with a particular bent for wood construction and upkeep of a truly one of a kind schooner, said to be a head turner. Tillicum 1 is a stays’l schooner, registered Victoria B.C. and is in her prime having been built in Anacortes, Washington in 1982. She is finely detailed inside and out, (10 types of wood total), built of Western Douglas Fir planking (carvel planked on 2x2 steamed oak frames), deck and foremast. She has been updated with hollow masts, the main being Sitka Spruce and oversize standing SS standing rigging. Last survey was June 2012, passed with flying colors. 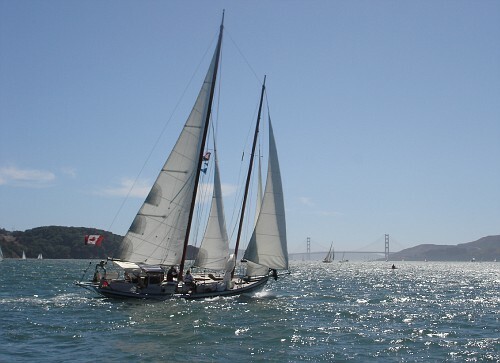 She has competed in the San Francisco schooner race in 2009 to a third finish in a fleet of 8. Recently she won first place in the Gloucester schooner race, small vessel division and best overall time of 14 boats. She has also been a feature vessel in the Anacortes wooden boat festival. As a cruising boat, she has completed a transit of west coast to east coast of Canada leaving Vancouver June 2009 cruising the West coast, visiting 10 countries, transiting the Panama Canal and arriving in New York City in July of 2011. This past summer she completed the return to Canada arriving in Yarmouth and travelling up to Lunenburg. Overall distance travelled in excess of 11,000 miles. The boat has ALL the desired cruising equipment to insure comfortable long range cruising including a 44hp Yanmar engine, Frig-o-boat refrigeration and Village Marine water maker. A large sail inventory of 6 sails includes 2 gollywobblers. Owners have resettled ashore in Nova Scotia.